Offer a new shelter just for martins by placing this Lonestar Goliad Junior Martin House with Crescent Entries in your yard. This fantastic, all aluminum unit creates a durable home, and its unique features make it wonderful for new landlords. The two levels each have four apartments, allowing up to eight families to roost comfortably. Its stackable design lends fun angles to your yard, and the crescent shaped, starling resistant entries exclude unwanted birds from using the home. 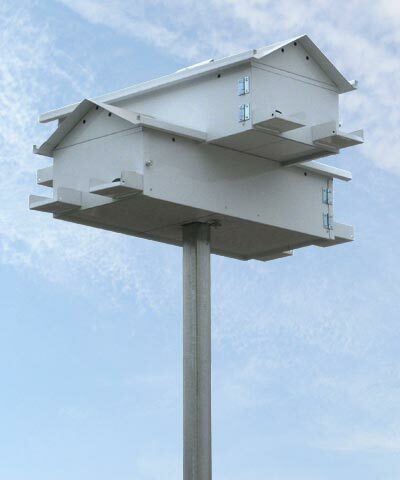 Each apartment measures 6" wide, 6" tall, and 12" deep, deterring predation by hawks and owls, and a porch with rails in front of each entry diminishes territory disputes. The white color of the home aids in regulating the interior temperature, and the door panels open with a spring loaded latch knob for maintenance. As your colony increases in size, add one of the Lonestar Goliad Single Story Additions (not included) to it for more nesting sites. The open center of this shelter accommodates the Lonestar Pole System with Winch (not included), for you to easily raise and lower the home for maintenance. Its riveted aluminum body lasts for many seasons, and the white color keeps it cool in summer. Turn a section of your yard into a martin sanctuary with this Goliad Junior Martin House with Crescent Entries. Assembly required. Made in the USA. Note: This description refers only to the Lonestar Goliad Junior Martin House. The pole shown is not included. Lonestar Predator Guard, Gray, 7" dia. Lonestar Pole System with Winch, Gray, 16'6"